Apologies for this post being a few days late, but my love for LARA bars demanded several tries and multiple flavor variations before posting—I really wanted to get this as close to the real thing as possible. Unprocessed – Raw – Non-GMO – Gluten Free – Dairy Free – Soy Free – Vegan – Kosher. Powerbar: Apple Cinnamon Flavor (from http://www.powerbar.com/)High Fructose Corn Syrup With Grape And Pear Juice Concentrate, Oat Bran, Maltodextrin, Milk Protein Isolate, Rice Crisps (Milled Rice, Rice Bran), Brown Rice Flour, Almond Butter, Apple Powder, Natural Flavor, Glycerin, Soy Protein Isolate, Cinnamon and Peanut Flour.CONTAINS ALMOND, MILK, PEANUT AND SOY INGREDIENTS. The only downside to LARA bars is that once you try them, you love them, and you’ve got to have them. And at about $1.60 to $2.00 per bar, times three family members (yes, baby likes small bites of them, too), it starts to get pricey. Hence my ersatz, but equally enchanting, rendition. A few raw ingredients, and no cooking required? Replication seemed possible. I found a handful of blog posts with recipes for homemade LARA-type bars, but they didn’t sound like they could possibly be correct. The primary problem was that quite a few recipes pushed for a one to three ratio of fruit to nuts. I tried it, and my suspicions were correct: far too many nuts, nowhere near enough fruit (an easy give-away: if there were so many nuts, it would always be listed as the first ingredient on the LARA BAR packaging; it is not). In addition, the specifications for each of the steps (how fine to chop/process the nuts and fruits, how to blend, etc) were vague. After a few delicious rounds of testing, I think I’ve got a good facsimile; Kevin agrees, and baby Nick kept pleading, “More! More!”. So here’s what to do for two bars (and this can be doubled, tripled, quadrupled, etc; it only depends on the size of your food processor). I’m using cherry as my main example, but I’ve listed some variations below. You can be as creative as you like with the combinations. The Raw Foods Movement is fascinating, but if the raw angle does not matter to you, and you have a bit of extra time, consider lightly toasting the nuts; it boosts the flavor significantly (but truth be told, I still like the raw flavor best). Or, if you like salty-sweet, you can opt for roasted, lightly salted nuts—yum! There is no rule saying you have to shape these into bars; you can shape them into little truffle shapes or squares (see photo 6). It’s a great candy alternative (and this comes from someone with a not-so-secret affection for sour fruit jelly bellies). LARA BARS use a multi-layer package that keeps out UV light and oxygen, which, in turn, maintains freshness without the use of preservatives. I use plain old plastic wrap and my refrigerator, then pop one in my bag when I’m ready to go. Set out two pieces of plastic wrap for shaping and wrapping the bars. Do this first; you’ll have sticky fingers when you need it. Place the dates and cherries in a food processor. Pulse until processed to a paste (photo 1). Transfer paste to a medium bowl (don’t clean processor). Add the nuts to the processor and pulse until finely chopped (photo 2). 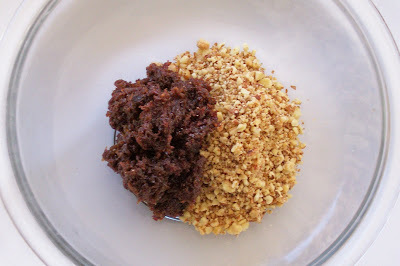 Add the nuts, along with the cinnamon, to the bowl with the fruit paste (photo 3). Use your fingers to knead the nuts into the paste (just keep squishing, it’s fun; brings back memories of play-dough; see photo 4). Divide mixture in half. Place each half on each of one of the sheets of plastic wrap. Wrap the plastic around each bar and start squishing into a bar shape form, 3 and 1/2 inches long, 1 inch wide and 3/4-inch thick); press against countertop to flatten bottom side, flattening top side and ends with flat of hand (photo 5) Tightly wrap the plastic around each bar and store in the refrigerator. Makes 2 bars. Note about using pre-chopped dates: Pre-chopped dried dates are much cheaper than whole dates, and sometimes are the only option available at the supermarket, depending on where you live. However, they are typically coated with oat flour (to prevent sticking), and sometimes a bit of sugar, too. They are too dry and hard to work as is in this recipe, but with a bit of tweaking, they will work just fine. To make them usable for larabar purposes, place them in a small bowl and cover with warm water (not hot or boiling water; this will make them turn to mush). Let stand 3 to 5 minutes until softened; then drain and pat dry. Not only will this soften the dates, it will remove any oat flour and/or sugar). Apricot-Almond: Use 6 tablespoons coarsely chopped dried apricots and 2 tablespoons date (to measure 1/2 cup total); use almonds for the nuts. 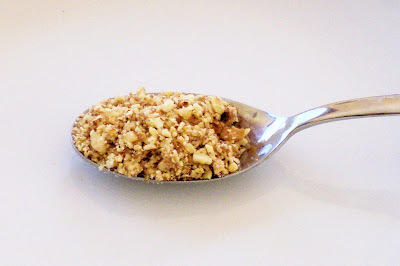 Tropical: Use tropical fruit bits (these come pre-packaged at the supermarket); use raw cashews for the nuts. Add 1/8 teaspoon ground ginger, 1/2 teaspoon finely grated lime zest, and 1 teaspoon fresh lime juice to the mix. PB & J (cheap and delicious! ): Use 1/4 cup dried cherries or cranberries and 1/4 cup raisins or dates; use raw or roasted peanuts (lightly salted or unsalted) for the nuts. Blueberry Bliss: Use 1/4 cup dried blueberries and 1/4 cup dates; use almonds for the nuts. Add 1/2 teaspoon finely grated lemon zest, and a drop of almond extract to the mix. Cashew Cookie Dough: Reverse the proportions of fruit to nuts–Use 1/3 cup dates for the fruit and 1/2 cup raw cashews for the nuts. 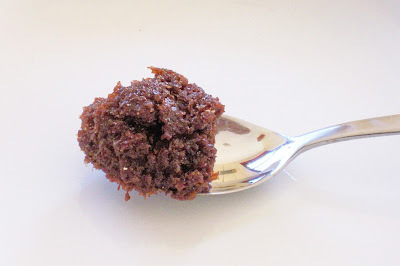 Chocolate Chip Cookie Dough: Same as cashew cookie dough, but add 1/2 teaspoon vanilla extract, pinch of cinnamon and 1/2 ounce very finely chopped semisweet or bittersweet chocolate to the mix. Pistachio Heaven: Same as cashew cookie dough, but use raw pistachios and add a tiny drop of almond extract. 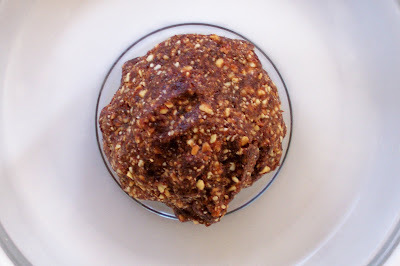 Peanut Butter Cookie Dough: Same as cashew cookie dough but use raw or roasted (lightly salted) peanuts for the nuts. Dates are included in a majority of the LARA Bars, so I thought I’d mention a few facts about these wonderful fruits. I love dates because I love brown sugar, and dates taste like brown sugar candy–hence they are a delicious and healthy way to curb my sweet tooth. One date has a mere 23 calories and is loaded with nutrition. Dates are an excellent source of carbohydrates (great for pre- or post-workout), contain no cholesterol, are high in fiber, and boast a wide range of nutrients, including calcium (32 mg per serving), Magnesium, Phosphorous, Potassium, Iron, Zinc, Copper, and Manganese. Dates also contain vitamins A1, B1, B2, B3, B5, C and more than 20 different amino acids; they help in the digestion and assimilation of carbohydrates, and help to regulate blood sugar levels and fatty acids content in our bodies. Oh my gosh, Camilla! THANK YOU! We love Lara Bars – but like you said they were just too expensive! I am so going to make these – they rock and look exactly like Lara Bars! Awesome! Welcome to The Foodie Blogroll!!! Glad to know you are a fellow LARA BAR lover :). Everyone needs to go check out your site (it’s on my list of favorite blogs/site–leftover queen). I cannot not keep up with you. I have made my second making of granola. We love it. I will make the broccli and pasta tomorrow night and the bars when I get back from Arizona. We are gong to Canyon Ranch for pilates, golf, and healthy eating. See you Monday. Your Lara bars look brilliant! Clever girl, how do you do all this? And tell me how you’re making the food look so professional — are you taking the pictures yourself? Mercy! You must tell me about your trip to New Orleans! Glad you made it back safely. My secret is silliness with a dose of nutty. Oh my goodness, Jan–I am seriously envious! Have a wonderful time (beat everyone at golf–I know you can!) And let me know about the food when you get back–I’ve heard it is fantastic! I have never had a Lara Bar so I do not know how it would taste. I just made them and they look like your picture. I think I will take them with me on my trip. Nice job, simple, great pic;s.
Unfortunately, the mixture would never make it to the plastic wrap stage, as I would have eaten it all. Hence, I’ll just stare at the pics. Thanks for figuring these out. Lara Bars are great. I’m going to make them for an upcoming canoe trip. I don’t know a lot about raw food but I’m quite sure you need to soak raw nuts in order to be able to digest them properly. I think it’s 8 hours or something, then drain before use. Apparently there are some enzymes in them that block your absorption. Cooking or roasting usually breaks down those enzymes. If you want to go the true Lara Bar route and use raw nuts soak them first. Can’t wait to test ’em out. thanks for your ratio breakdown – i just tried the cherry variety subbing dry roasted soy nuts; pretty tasty! Umm, a banana bread flavor sounds great! I would definitely steer clear of fresh bananas–far too much moisture, you would have some delicious goop (that I would definitely eat) , but not a bar. I would experiemet with dried banana chips (I am eager to give it a try when I am back to my home kitchen). I would place them in a heavy zipper bag and pound the heck out of them; it would yield a great concentrated banana flavor. I would use the cashew cookie template (dates, nuts) and decrease some of the nuts, replacing them with the crushed banana. A few pinches of nutmeg and cinnamon, mybe a little splash of vanilla…I think it sounds incredible! Let me know! I’ll try, too. I am thrilled to find your website and the recipe for the LARA bars! I tried the cashew cookie one…but I have a question. It seemed like there were WAY more nuts than dates after I chopped them. But the main question is about the dates. Since it was a small amount I used my Cuisnart (small/mini) food processor. The dates ended up “finely chopped” but NOT a paste. It didn’t look like you pic at all. I have a larger processor, but it really seemed like overkill for such a small amount. Do I need the extra power or something? I think the paste is important because how else is my bar going to stay together? Welcome, glad you are excited about the LARA bars. Ok, here’s my gues re: the dates. It really shouldn;t be the food processor (I use my little and my big processors, both work fine), Any chance you are using the pre-chopped kind? The ones that look like little pellets coated with powdered sugar (in a box)? If so, they are way too dry (I have a not next to dates in the ingrediets list). You definitely want to get whole dates and then chop them; they are really moist and gooey. They are typically in the produce section in the grocery store. Also, feel free to gradually add the nuts until you get just the consistency you like. Thank you so much for your response. You were right, I used the Dates that I found in the area with the raisins, in a cannister. whole and pitted, but boxed nonetheless. I will be off buy fresh dates tomorrow and try this again. I will let you know how it works out! Dentist just said I have lots of cavities from dried fruit (Larabars) and am leaving monday for Thailand. What to take instead for pick me up when low bloodsugar hits? Has anybody tried making the chocolate-chili kind? I’m experimenting with a recipe for one right now but I’m wondering if anyone else already has one to share. Thank you for sharing! I’m going out to purchase some ingredients tomorrow morning so that I can make some in the evening. I bought a bucket of dates in the hopes of attempting to replicate Lara Bars. I love them as a snack but they’re rather pricey. Thank you for doing the work for us. Your recipes will save me a lot of headaches. I’m glad you had the idea first. Camilla, I can’t thank you enough. I made a large batch just now, using dates, mixed berries, walnuts, almonds and a bit of cinnamon. I had been buying the bars and like everyone else love them but hated the price. I spent $6 on the dates and fruit and I am guessing another $2 on the nuts for a total of $8. Yield was 12 bars. They are in my fridge, wrapped in that self sealing glad wrap stuff. I suppose if you want to keep them longer you could use one of the meal sealers like foodsaver. HM. I am training for my first ironman triathlon and am always looking for good nutrition. Dates have long been a marathoner secret weapon but oh so sticky 🙂 These bars will be perfect. Next time I will try the Chocolate variety using unsweetened cocoa and some coconut flakes. Not sure if I will stick with just dates then or maybe add some apricots…yum yum yum and economical is all I can say. Camilla, this is fantastic. I’m a confirmed Lara Bar addict. It started about a year ago. I found your blog while searching for less costly ways to feed my habit. I have been thinking about experimenting with making my own, but you’ve just jump started the project. I’m going to start with duplicating (hopefully) the chocolate coconut chew…my hands down favorite. I have organic raw cacao, and organic raw coconut on hand and intend to whip up a batch this weekend. I’ll get back to you with results. Great recipe. Have you tried to use a twin-gear juicer (Green Power) to make the Lara bars? I just bought one and am looking for things to make. Hi! I am checking back in…I am still making my Lara bars and I am thankful to you for every batch! The recipes are great…My husband is addicted! I have a question and a comment. Question: Any idea how the Ginger Snap flavor would be made…apparently my husband really liked that flavor when he bought it. Raw Ginger, crushed ginger, paste, powder???? any thoughts? Comment: I am a mom of two who cannot to have her hands filled with lara-mix at any given moment….so what I’ve been doing is this: I take a large ziplock freezer storage bag and I put the date paste in it along with the nut mixture. I let the air out and seal it most of the way. NOW I can mix and mush my bar together without getting my hands dirty! I roll it into a “log” in the bag…then cut it into equal portions to stick in the fridge. I use either saran or snack size zip bags from walmart. Just thought that maybe that would help someone. I got so much info from your site, I thought I would add my two cents! Anyone have a tip or method for making the date paste? when i try to blend it it just goes to the sides of the blades and doesn’t chop up. I have to stop and scrap it down and it does the same again. Takes ages. It really helps to have very soft squishy dates; it they are hard (especially the prechopped kind), it can help to pour a bit of boiling water over them and let them stand for about 15 minutes, then drain off the excess. Then they should chop up just fine! I am so excited!! My friend came home for the weekend and turned me on to these yummy bars, but like everyone else, the expense is just too much to support our habit. SO! found your website today and we were so inspired that we are going to buy a processor tomorrow and get in the kitchen and make “lara bars” all day! i can’t wait!! any suggestion on best brand of processor without spending a fortune? Hooray for mini food processors! I had a little $40 Cuisinart one that lasted me all the way through grad school and made just about everything in it (I still have it, and it still works, but it’s pretty decrepit at this point). I had read so much about Lara Bars and finally tried one for the first time last Sunday. I immediately thought, ‘I can make these!’ And lo and behold there are plenty of people out there that have been doing the same. Your recipes seem to be the best I’ve come across though. Thank you so much! I’m on to explore more of your site (and make a list of ingredients to make some yummy bars tonight). First, thank you so much for this recipe. I’ve made these a few times and here is my tip: if you have a Kitchen Aid mixer and the grinder attachment it makes the perfect fruit paste. I almost wiped out my food processor and a Blendtec professional blender with that step. My personal version is dates, cherries, almonds and some unsweetened Dagoba chocolate powder (to taste). I’ll be making a batch to take camping next weekend! Wow, I am so glad that I stumbled upon your blog!! I cannot WAIT to try out these Lara Bars. Definitely trying out the Cherry Pie flavor first!!! Already have the few ingredients!! Great Site!!!!! I have a potentially stupid question- are the dates you used in the dried foods section- but whole not already chopped? I saw chopped dates that have dextran or something as an ingredient. I’m guessing not those? Can I find the kind you used in a regular supermarket or do I need to go to a trader Joe’s or whole foods? No dumb questions in cooking! I am glad you asked. I’ve been making something like this – and am looking forward to trying your recipes. I dust mine with carob powder at the end, which makes them extra delicious and not so sticky to handle. Excited to try this recipe. Do yo know how long the bars would last in the frig? Thank you so much for this site! I just discovered it, and I already have a list of about a dozen things I want to try. Thanks so much for posting this! I just recently discovered LARA bars and couldn’t bear to spend $2 on each bar. I love the lemon variety best, so I used lemon zest to make mine. I have to confess that I have never had a lara bar, but have heard only good things about them – except for the price. I love knowing exactly what ingredients are going into the bars. I”m going to try some of these. Thanks so much for sharing the recipes. I love Lara bars especially the pecan, lemon and key lime. Now I can make them myself. Thanks! Thank you for providing this service to the Lara Bar loving blogosphere! Thank you so much for de-mystifying LARA bars. Any chance you could take on the Lemon Bar version too? It’s my fave. Forget the plastic wrap. Put the nuts in the bottom of a NON-STICK frying pan. Drop the date-paste on top of that. Then pick up some nuts and put them on top fo the dates. Using your hands, fold the date paste until all of the nuts are incorporated. Works for me! I didn’t know there were so many enterprising people who loved Larabars but not the price! My improvement on home production is using leftover cereal bags (liner for boxed cereal)for the rolling out process. The mix stays contained and the slightly waxy surface prevents sticking for easy removal. I just re-read this looking for the cherry chocolate combination, and came across the request for the Gingersnap Larabars. I took the spice combination from the Grammercy Tavern Gingerbread and added a 1 T to my mix. Depending on how large your date/nut combo is, you could add more or less. There are 8 people in my family, so I usually deal in large quantities! Hi! I just made my own version of Chocolate Coconut larabar and then decided to google and see if others had any home made recipes. Lots of people! made two batches, one with dried cherries/cranberry mix, and an apricot with crystalized ginger mix. They are wonderful. thanks so much for the pictures they helped me know I was on target, and putting the stuff into a bag to squish around was a great hint. I will be making a batch for an event this week. I think I will make them into little balls and roll in coconut and/or nuts. Wonderful!! I’ve been wanting to recreate the LARA bars, your site was my first to look at and I’m hooked!! Will be trying this tomorrow. Thank you! I was just looking to order larabars online and now I think I’ll just make them myself. Thank you, thank you for sharing! Anyone else doing the calorie calculations on these and getting substantially higher numbers? I made a few variations and am excited to try them, but no matter how I crunch the numbers, I’m getting closer to ~240cals per bar. I made cranberry-hazelnut bars, and they’re ridiculously good. Thank you so much for sharing this! I love simple and I love using foods in recipes without adding sugars, so these bars are absolutely perfect. I made three kinds, and for one I actually used prunes instead of dates. They were stickier than the ones made with dates (I think that can probably be remedied with a few more nuts) but delicious and about 1/2 the amount of sugar. I posted pictures here: http://www.bodyjournablog.com. Love these! 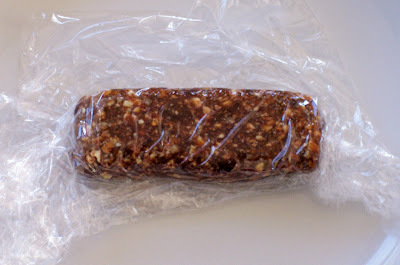 Just made the cashew bars – but wrapped them in paper like pieces of candy. My 3 year old loves them! I like the homemade better than the larabars themeselves! Thanks for sharing! I discovered Larabars this week and am totally obsessed. I’m excited to try this recipe later this week for a company “bake off”. Going to make them as bite-size balls. I’m sure they will stand out, being raw and all…lol. So my question is this…if you had to pick your favorite flavor to share with others, which would it be? Thanks so much for the recipe, I will check back in and let you know how the competition went! I am so excited to hear that this recipe is making all of you so happy! I make at least one big batch of these a week (varying the flavors)–I love knowing that others are out there doing the same! Jeanette, my two favorite are the Cherry bars (#1 for me) and Chocolate Chip Cookie Dough (#2 for me, but #1 with just about everyone else). The PB &J bars/balls have also proved to be great hits , which is esp. wondeerful since they are so inexpensive to make! Do let me know the results of your taste test! I just found your recipe and am so excited! I do have one question though. Both of my children are allergic to nuts (tree nuts and peanuts). Major bummer :(. So my question is, do you think I can used toasted oatmeal as a replacement? If I could find soy nuts or sunflower seeds not processed in a facility that process nuts I’d buy them and use that. But right now I’m trying to use what I have on hand. Any thoughts on this? I completely understand! My sister is severely allergic to peanuts and hazelnuts (it was so rare when we were little, but so many of my son’s little friends have allergies now, too). Seeds of all varieties (hemp seeds, pepitas, sesame seeds, flax seeds) would all work well here, but I know, it is hard to find ones that are not processed in a nut-free facility. I think the raw oatmela is an excellent idea. If you are willing to go “un-raw”, a crunch cereal, crushed slightly, would also be great. I know this may sound unusual, but I have tried it in cookies as a substitute for nuts, and I think it would work well here, too: cooked grains, such as brown rice. When I used it in cookies,I spread the cooked rice (short grain) on a cookie sheet and baked it at 300F for about 15 minutes to dry it out, then cooled it (you can keep excess/leftovers in the freezer). Go for it, and let me know how it works! Just thinking. I like chewy bars but I also love Crunchy. Have you tried baking them to see if they turn crunchy or what they would taste like? Thanks for the great recipes. They will be made this weekend! Cooked rice! What a great idea! I am going to give that a try tomorrow. I did try the oatmeal (resulted in good texture) and if I hadn’t added a few sesame seeds I think my kids would have liked it. I toasted the seeds and the flavor was just too intense for them. I have a feeling the brown rice would be just right. I’m so excited to give it a try. Thank you! On my grocery list–and I love the date info. THANKS! these looks amazing and so do your other nut,seed, and fruit bars. I baked mine 3min/side at 450F, made them a bit easier to handle. It seemed like baking much more than that would dry them out. I also used dried mangoes instead of cranberries, it worked really well. You do need a food processor for this – the date paste needs to be really fine. Camilla! You are a gem! Thank you for these recipes. My friend and I are about to embark on making several different kinds. I always used to keep a Larabar in the glove box. I’m self-employed, a mobile business, and occasionally find myself desperate for some food. Any easy ideas as to how I could package and UV-proof, heat-proof, and preserve my own bars so they could last a couple weeks unrefrigerated? I had considered adding agave or honey to my bars as a preservative, but I don’t really want the added sweetness. Wonderful article, very well explained. yesterday I read thru the comments on the blog, and went to Costco to buy dates, pecans and other ingrediants to make my own LaraBars.. I used my Mini-Oscar and it works great. I now have a few in plastic wrap in the fridge chilling, and my question is to find out how folks have dealt with the overall stickiness of the bars? i was wondering about tossing them in a bag of oatmeal? I was looking online to find “cheap” lara bars for my wedding gift basket when I came across your recipe. I went right to my kitchen and tried it. Absolutely delicious and I can’t wait to experiment with other flavors! I think it would be too complicated to make my own for 200 guests, but I’ve now got a stash in the fridge and plan to make more for my next Team Diva bike ride. The girls will love the 🙂 Thanks so much! This was fun… I unfortunately found your recipe after having made my own… but I think your recipe would have been much better because I just eye-balled everything. Used Date, dried Cranberries, cinnamon, ground almonds, a few hammered out banana chips, and a touch of vanilla protein powder. I topped them off by sticking some roasted spaghetti squash seed in the top. The seeds were lightly seasons (savory) which added a nice sweet-salty contrast. I cannot wait to go and get more dates tomorrow to make some of your other recipes! Thanks! I know this is an old post but I just tried these. I made 1 batch the exactly like the recipe. Then I decided it was way too messy & created too much waste. I decided to grind the nuts then add the chopped fruit & process. It worked perfect! WOW! I just made these with dates, cranberries and almonds, and I must say how delicious they were! I added a little more fruit than the general proportion, but not much. And they turned out amazing! thanks for the great recipe-I’ll have to make these for breakfast-on-the-go! mmmmm that these sweets are rich …… I would like to learn how to do. I love this article, even though I only just discovered it. Had to link to it per my brief post about Larabars. Can’t wait to begin experimenting! Like everyone else here THANK YOU!! I’ve been waiting to fine something just like this the raw is the angle I’m the most excited about! I love lara bar because is so delicous, and the most important,is healthy. I think I know what I’m testing our new food processor on! I have less issue with the cost of Larabars than with the ingredients, as they ALL contain either cashews or almonds and my husband is allergic to both. Now I can try making him a cherry pie variant with walnuts and sunflower seeds without having to worry too much about the proportions. Thank you so much! and the company was acquired by General Mills. I am seriously envious And let me know about the food when you get back–I’ve heard it is fantastic! oh my goodness, I am so happy to have found this. my family is seriously addicted to Lara Bars. When I find them for a dollar apiece at Kroger, I stock up, but when the family eats four a day, they go fast. I bought whole pitted dates sold in bulk at an ethnic market near me, and went through my baking cabinet to see what I had. I wound up using 1-1/2 toasted unsalted pecans, 1 cup dates, 1 tsp vanilla extract and a pinch of salt. My ancient Cuisinart worked just fine for this. Et voila – pecan pie bars!! They seriously taste just like pecan pie. And I am ridiculously happy about them! About three dollars each for the dates and pecans, and when I’m done I’ll have about a dozen bars. Thank you, thank you, thank you!! Clarification re: amounts and yield in my comment above: I got seven bars with the ingredient amounts above; from the container of dates and pecans (which turned out to be three dollars worth of dates and seven dollars worth of pecans) I got eleven bars (slightly bigger than Lara bars) a dozen donut-hole sized balls, and my eight year old and I did some serious sampling!! Next up: almond cookie bars: dates, toasted almonds, and almond extract. And maybe a hint of lemon zest. has a pretty good lara bar recipe – she makes a big batch though as she is feeding 5 kiddos (with one on the way). Everything I have tried from her blog has been awesome! Can’t you just chuck the dried fruit and nuts into a food processor and then smash it all up for a while then be done? and I love it – just $20!! Have fun everyone. We are planning to have a little cooking project this coming weekend. I thing I am going to suggest that we try this recipe. This is going to be fun. Nice post, thank you for sharing this . Peanuts are about the only nut that should never be eaten raw. I believe theyre mildly toxic to most people, possibly much more so in more sensitive people. I came across this by pure accident, linked from a comment in TheKitchn. Made the bars last night and explored your blog a bit – am now definitely a huge fan. Can’t wait to try everything! Thanks! Thanks so much for this recipe!! I see LaraBars in the store ALL the time, but they’re sooo expensive! I am going to make these! Thanks for experimenting and coming up with the recipe! You’re amazing! I would like to read few more articles from you. Thanks for the recipe! I just made a batch and added some cocoa powder, coconut flakes, protein powder and a scoop of coconut oil for moisture and they turned out great! only problem is that the dates were $7.00 a lb so not much of a savings! Any idea where to buy dates for less? Is there a recipe for the Apple Pie version of the homemade Lara Bar? Thank you for the article. Prepared, turned out very tasty, everyone enjoyed a close. Thanks so much for figuring out and sharing these recipes! I got myself a food processor this week just to make them. Very Cherry tastes just like Cherry Pie; ditto for Cashew Cookie. thanks for some great ingredient combo ideas! Yum. We like these! Truly addictive 🙂 I used dates, almonds, and a bit of unsweetened coconut– and some vanilla. Incredible. I will make the broccli and pasta tomorrow night and the bars when I get back from Arizona. We are gong to Canyon Ranch for pilates, golf, and healthy eating. See you Monday. These are awesome and sooooo easy! Thanks for sharing! I’m looking forward to exploring more of your recipes. My preschooler loves to cook and your recipes are very kid friendly! I just made a bunch of these for my sister for Christmas! They were really yummy and easy to make. I had to put the fruit in my blender rather than the food processor but they still turned out wonderful! Thank you for posting! Thank you for posting these! I just made a bunch for my sister and she will love these, they turned out so good! Wow outstanding cars.Its very awesome design.I wish to buy that type any car. Do Lara Bars have to be refrigerated? Thank you, thank you! Would you PLEASE do the same for the chocolate & coconut Raw Revolution bar (& other flavors) in which I’ve just fallen madly in love?! Thank you for the great recipe! I made some today with dates I have had for ages and it worked great. I totally made it up as I went, and used a combo of dates, cherries and apricots for the fruit and crushed almonds for the nuts. I then went totally off-recipe and added some wheat germ I have been wanting to use up and a few dabs of peanut butter, because I hadn’t been measuring and felt it needed just a bit more moisture. They are really delicious! I had the kids help mix them up and I rolled them into balls instead of bars. They didn’t like them too much that way so I rolled the balls in a combo of cocoa powder and powdered sugar. Really isn’t much but coats the balls really well, making them just a tinge less sticky and more inciting for the little ones (I like them just fine plain, too!). Thanks for these great recipes. My 4 year old is excited to try to make our favorite LARA Bars ourselves! I am wondering if it matters what kind of whole, pitted dates you use, or if you’ve tried different kinds… medjool, halawi, honey, deglet noor? I have a 4-year old, too–he loves these 🙂 So much cheaper than buying the bars! I have used all variety of dates–I typically go with what is on sale. I’ve even used the chopped dates because they are often very inexpensive (I’ve found them at Walgreens for 99 cents for a half pound)–they are too hard as is, so I give them a rinse in hot water to remove the sugar and soften them (don’t soak–they will turn to mush). I just found this post because I was looking for a recipe for something like a Lara Bar, and that’s exactly how they turned out for me. I did a variation with figs, dates and almonds—since that’s what I had on hand—and rolled them in shredded coconut to make them less sticky. I’m looking forward to my snack at work tomorrow and also to trying more recipes. Thank you. My four year old daughter and I made these tonight–shaped them in letters and cute girls! 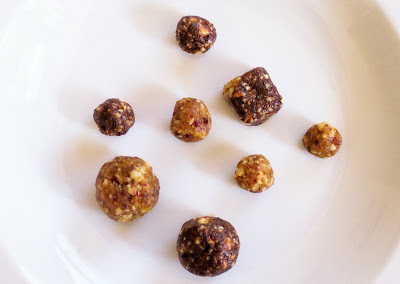 They are a delicious alternative to the sugared-up bars they offer in the grocery store. I can’t wait to try more of your bars! 🙂 SOOO happy to have found your blog, Camilla! This is great! I have been buying my Larabars at Costco, but you are trapped into their flavors. Homemade lara bars are so super easy to make! thanks for posting! I recently discovered Larabars & like everyone else found the price to be a bit much.Yesterday I tried your recipe & made cashew cookie and PB & J. I couldn’t believe how close they are to the real thing!Thank you! thanks for the recipe! does anyone have a suggestion for someone who is trying to avoid plastic? i’d love to be able to make and store these without using the dreaded plastic wrap. I am a big fan of both wax paper and parchment paper, both of which will work well to wrap these up and keep them moist. Foil is also a good solution. Cheers! Thanks for the Lara bars recipes. I love them! I also made a batch adding shredded coconut and cacao powder. I added a little bit more dates also. I dehydrate my bars for about 12 hours. I prefer them a little harder. What a great addition to my raw snacks! I’m not sure what is more impressive, that you created a wildly successful hack of a LARA bar or that you are following up on everyone’s comments 2 years after you posted the original recipe. My wife and I loved the Clif Nectar bars (similar to LARA but fewer nuts) and were very disappointed when they took them off the market. I decided to figure out a way to make them and surprise my wife with an unorthodox date night of dinner, movie and shopping for ingredients to make these. I made a few batches this morning (apricot cranberry almond, cherry almond, chocolate chip cashew and blueberry almond) and they all turned out nicely. The next go around, I think I’ll reduce the amount of nuts to get the texture I’m looking for, but overall these were a smashing success. I also rolled a bunch into fruit snack size and packed them for my son for a snack at church. He pounded almost all of them. To mitigate the sticky factor, I rolled them in the nut flour that remained after pulsing the almonds. It worked like a charm. Both my wife and I escaped church without having to add our clothes to the dry cleaning pile–and that’s saying something for parents of a busy two year old boy. I’ll be experimenting with some other flavor combinations in the future and will definitely try your black bean bars and the other fruit/nut bar you’ve got up. Anyway to make the coconut pie one? I am scared of the oil part, lol. I second the coconut pie one. Wondering how coconut oil might alter the fruit percentages since it would make it more moist. 🙂 Thanks so much! I am SO excited to try these. I have a feeling I will be making these for a long time to come as they will be perfect for snacks for myself and kid(s). As for food processors: I replaced my big cuisinart one with a bug kitchenaid (I can give you the exact model number if you like–I think all of thier big ones are pretty much alike except for cup capacity) SO much better! The cuisinart would get that awful plastic burning smell whenever I processed anything slightly heavy duty (even when brand-new). Love love love how easily the ka one runs. it is proving well worth the price. Grind in food processor, form into balls, roll in cocoa or coconut. like many others here, I was searching for more affordable places to buy Larabars a few weeks ago when I found your blog. I definitely prefer the option of making them myself since I can control exactly what goes in and save a little on the packaging as well! I finally ran out of my stash of purchased Larabars so I made several of your variations last weekend & tucked them away in the fridge. I just now had tasted the chocolate chip cookie dough one and I’m pretty sure I like it more than the ones I used to buy! Thank you so much for sharing your knowledge and process. I can’t wait to enjoy the rest of them and I look forward to exploring some of your other recipes. I’m planning to try making the lemon and key lime varieties on my own. I will post the recipes once I have them mastered. Very worthwhile piece of writing, thank you for the post. ohhhh I”m super excited to have found this on Pinterest! I shall go for my 1st attempt to make Homemade Lara Bars tomorrow! Thanks for this – was looking for ideas of what to take on our hiking trip next week following a recent diet change and couldn’t find anything that looked like it would work with the proportions (as per your experience when trying to find other recipes) until I found your fabulous post! Now I have the proportions I’m off to raid the fruit and nuts out of the cupboard and whip up some options. This looks so fantastic! Thank you so much for sharing!! Can’t wait to try these out for myself and my kids. They look amazing, treats with a twist! Camilla- this is sneakily brilliant of you! Just wanted to say thanks for the basic recipe. Using that recipe, I made Apple Pie bars and they tasted great! OH. mygosh. Thank you for sharing this. I love Larabars but they are so expensive (unless I find them on clearance and have a coupon). Thank you SO much! I can’t wait to whip up a couple batches! I want to make a bigg batch but i am having trouble figuring out the measurements… any one have a large batch measurement for me!?!! I am loving these. They are just the right hit of sweet and energy and awesome price. Hope you don’t mind, but I’m going to link to your post so all my readers can get in on it. I’ve living off of Clif bars for the past week because I’ve had midterms and projects galore and thus no time to cook. After all that was over, I took a look at the ingredients. Big mistake, as I was horrified at all of the processed nonsense I’d put into my body. I don’t care if it’s organic; there should not be three types of sugar in one bar. Also, what on Earth is “Natural Flavor.” It’s so great to have a way to make my own bars using whole, organic foods of my choosing (and not have to drop $1.50 on each of them). I just finished my first batch and I’m utterly delighted. They’re delicious (and actually better than Clif bars, in my opinion)! I’m going to put this up on my Pinterest (it automatically links, so you needn’t worry on that front) so all of my friends can see. Thank you so much for posting this recipe. Nicole! I am thrilled you like the bars– thank you so much for stopping by to post, too. And thank you even moreforsharing the post on Pinterest!!! I love the Apple Pie bars, but apple rings tend to be a little harder than cherries or apricots. A good work aorund I found was to let the apple rings sit in hot water for a few minutes and then drain them. Then you can substitute just the same! LOVE LARA bars. So happy about this post. Planning on making these really soon, thanks so much! Hmm… I’m new to this whole Lara bar thing – never actually tried one. But they are expensive, and if I could make them on my own, I’d like to. With that said, dates can be hard for me to find – period. Could I use prunes instead?